Neighbors Save 2 Adults, Baby From Burning Home in Md. 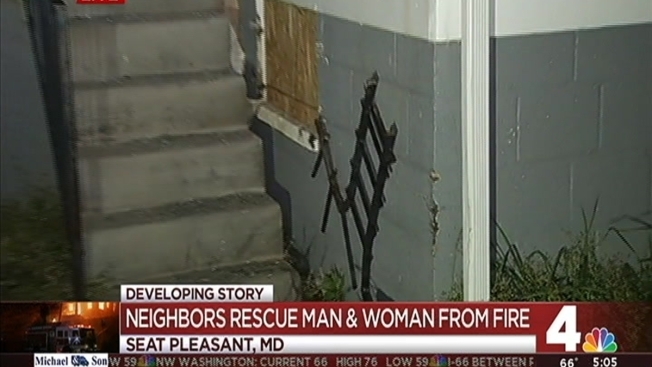 Two quick-thinking neighbors saved a man, woman and baby from a Seat Pleasant, Maryland, home after a fire trapped them in the basement. The fire started on the second-floor of a home on G Street near Seat Pleasant Drive Thursday night. The fire kept the man and woman from using the stairs, and security bars on the basement's windows trapped them inside, fire officials say. Neighbors Rick Belt and Leon Page sprang into action after seeing hands waving at them through the bars. "When he said they were in the basement, I saw hands out the window," Belt said. "Immediately, I went and got my truck and chain, and pulled the bars off the windows." Page said the woman handed the baby out of the window first. Three Seat Pleasant police officers on a routine patrol in the area helped pull the man and woman out of the window. A third adult was also in the home at the time of the fire, but out OK.